This product if definitely one of Etude House's most popular product (globally). I got this from the site, Kocomall, for review purposes. It have a few claims that you can see above. It also claims anti-wrinkle, whitening, and ant-darkening. I find this BB Cream to be in competition with Missha and Skin79 BB creams because they are all very good (fore-shadowing the review). This product also has 30 SPF/PA++ which I think is pretty decent for being a BB cream. It also says it will givr you sheer glowing skin. I have to give an A+ for packaging because it is very consumer friendly and eye-catching. Etude House put a lot of thought in this and wrote the information in an easy way to read way. Even though this box is written in a lot of Korean, it can communicate to tell me why this product is beneficial in the little English it has. I really like the pump, I think it is an instant like. The only little down side is that the cap will fall off pretty easily, so if you drop on a hard surface the cap will loosen or just come off. If it is moving around in a bag/purse with a lot of items. It is most likely to fall off. First off, it is quite noticeable that this is not sheer coverage, or it does not match my skin tone. I got this in the lightest shade. Even though it is very light, I mix this with some foundation to get my color. So it matches and I am still getting the benefits of the bb cream. It definitely a medium to full coverage. It does have the gray tinge to it like most Korean bb creams. It does oxidize, but not to my skin-color, but closer to it. It lasts for a few hours (11 am to 6 pm~8HRS), until I notice my dry patches begin to show. It does get oily on my combo skin, but I deal with that with blotting sheets. It also has a dewy/satin finish. 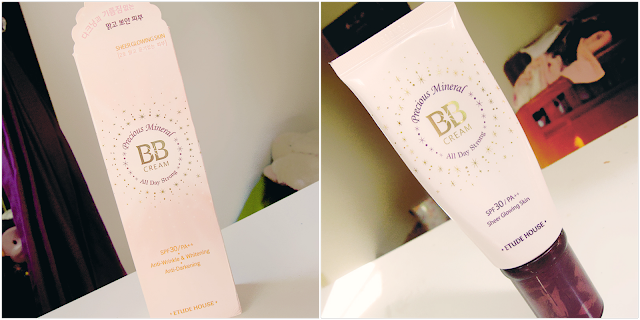 I would recommend this BB Cream to everyone. It comes in more shades, but sadly it does not come in an ebony color:( I will buy this again and if you are interested in a bb cream, this maybe the one for you. wow, this one's coverage is not sheer at all, unlike any other BB cream I have tried so far. Do you find the texture is hard to blend in? I use Skin 79(hot pink) and find the consistency quite easy to blend and it doesn't give the grey-ish tone as some I have tried. I'm sure your not the only one:) You should buy it, it is great! Blend-ability depends. If you try to rub in a small dot of it, it is harder to blend, but a dime size is much better because it is more runny and blends easily. Hi, what a coincidence that I just bought this :) New follower here, cute blog..would you mind following me back...pretty please :) www.withlovekisses,blogspot.com...can't wait for next Saturday to join your bloghop..Hope I can join..Thank you soo much. Thanks a lot! can't wait for the halt!